I tend to get a lot of questions whenever I play Spanish versions of American songs in the clubs. People find it funny and I have to admit there is a certain kitsch value to it. However, for Banda Macho I guess it was no laughing matter. They pretty much made a living pumping out tunes that belong to their neighbors to the North. I have 4 of their LP’s and they are all cover albums. For some reason it is a subject that I am interested in, especially how Latin Americans interpret musical genres of American culture. And I am certain I will explore more of this in the future. 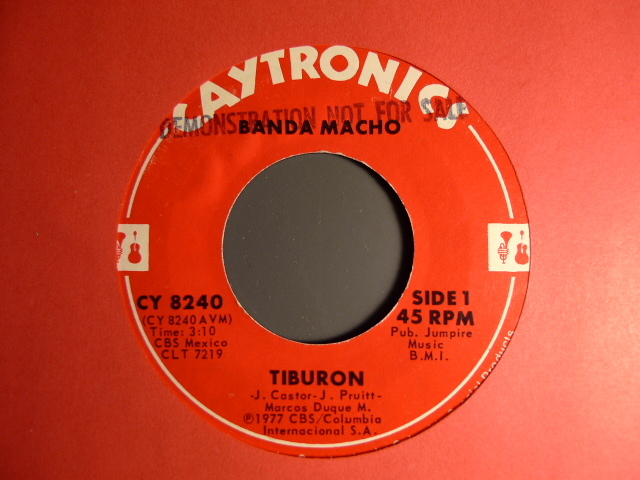 Banda Macho hails from Monterrey Mexico and are still around from what I have read. The song Tiburon (Shark) draws from both the popularity of the movie Jaws and Jimmy Castor’s song “Supersound” (sans the 1 minute break at the end).